Nielsen gallery honors artists who aspire to the mystery that, in the past, has taken form through Mayan steles, Chinese Bronzes, Egyptian carvings, African terracotta’s, and Medieval altar paintings, among others. We have no expectations on how a contemporary artist might express this mystery, figurative or abstract, using traditional or innovative mediums, whether after schooling or completely self-taught. The ambition to pursue spiritual art might be said to be contrarian, even retrograde, in today’s art world. Yet we distrust the commercial forces that have encouraged the development of a sophisticated “art market,” which has objectified art, through auctions and art fairs, and undermined the standards for art during the past 30 years. 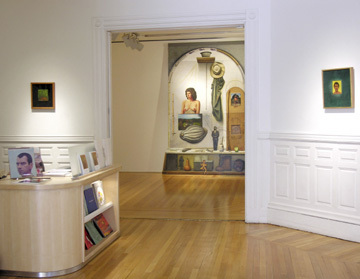 Founded in 1963, the Nielsen Gallery, until 2009, was located in the historic Back Bay district of Boston at 179 Newbury Street. Notable gallery exhibitions include an exhibition of 44 Jackson Pollock Psychoanalytic Drawings in 1985 and, in 2004, a group show entitled “The Self-Reliant Spirit,” which featured Albert Pinkam Ryder, Ralph Albert Blakelock, Arthur Dove, Marsden Harley, Jake Berthot, John Lees, Gregory Amenoff, and Albert York. The gallery had the privilege of holding a rare Albert York exhibition in 2002. In 2008 the gallery organized a major two-part survey of John Walker paintings. The gallery has also had the honor of representing the estate of Porfirio DiDonna and regularly presenting the work of Martin Ramirez, Christopher Wilmarth, Jake Berthot, Harvey Quaytman, Gregory Gillespie, Sachiko Akiyama, and Joan Snyder, as well as many others. In 2005 Nielsen Gallery was given the International Association of Art Critics (AICA) award for “Best Show in a Commercial Gallery in the United States.” The award ceremony, for the exhibition, The Privilege of Solitude: Alfred Jensen and Forrest Bess, took place at MOMA in New York. In 2009 the AICA chose the gallery for a second “Best Show” award for the exhibition Jay DeFeo: Applaud the Black Fact. The two AICA awards are evidence of the respect the gallery has earned through its persistent commitment to the personal voice for spiritual art today.